Christmas is coming. But before that, we have Black Friday. Either way, the time is ripe to give consumers the best shopping experience you can muster and bring in that extra dough. For its part, Google is making improvements to Google Shopping. You may know it as that tab that you forgot you could click when you perform a Google search, somewhere to the right of images and maps. 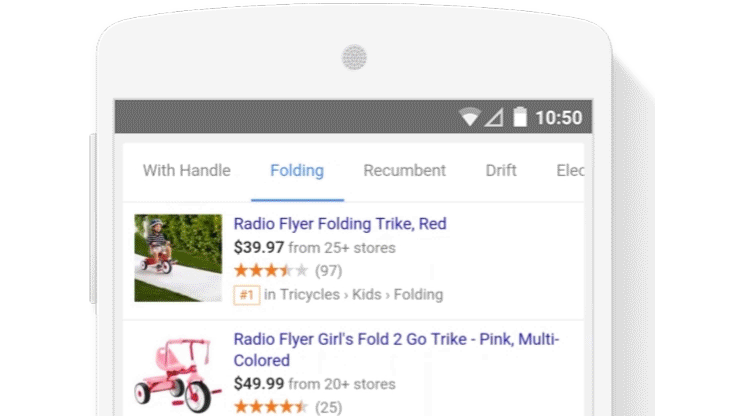 The updated Google Shopping experience lets you easily switch between various filters like features and brand without having to load a new page. Instead, you just swipe between tabs. Users can then pull up specific items, look at pictures, read reviews, and quickly swipe to the next product in the list. Google Shopping will tie into your local area by showing you which retailers have units in stock and how far away they are from your current location. So this holiday season, maybe you'll stop by Google on purpose, rather than accidentally after realizing you didn't fully type out the Amazon URL.